This is one of the recent Fabrice Moireau sketchbooks I bought. It was published in 2006 by Gallimard Loisirs. It's a square format 72-page hardcover. Le jardin de Claude Monet à Giverny translates to The Garden of Claude Monet at Giverny. 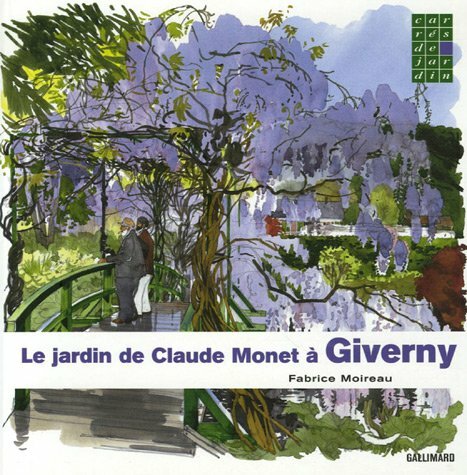 The house which is located in Giverny, Normandy of France, is actually open to the public. This book collects the wonderful watercolour sketches drawn of the garden, houses and ponds there. It's like a guide book exploring the different areas. The text are all in French though. I think it manages to capture the beauty of the place well. The garden is really charming. There are all sorts of flowers and plants, and the landscaping is idyllic. There are also drawings of the interiors of the house filled with paintings, furniture and all the little things like utensils. In the hands of Fabrice Moireau, you can see the details and how colours play around. It's a beautiful sketchbook for anyone who likes nature, watercolours and sketchbooks.